I said it before and I'll say it again. "LOVE THE G.I. JOE SIGMA SIX LINE". I look for them every where I get a chance and even get a figure if i already have him at time. I went to a local comic and toy trade show and asked a vendor with some G.I. Joe he was selling if he had any Sigma 6 figures. He just looked at me and said "I hate that line"! "Oh" I asked why? He said he hated the look and the design. I guess is not for every one. I guess more figures for me to collect. I'll be post more G.I. Joe Sigma 6 figures as soon as I can. Stay tuned. SNAKE EYES spent his youth studying with masters of over thirty martial arts forms. He began his covert ops work in a mainstream intelligence division and was quickly spotted because of his mastery of ninja disciplines and his uncanny ability to move undetected. He was the most sought after operative for missions that required someone who could infiltrate secured areas that no one else had ever been able to access. During one mission, he used this specific knowledge to "join" a powerful ninja security force and get inside the compound of a deadly gang. He was chosen for the SIGMA 6 team for his superior martial arts skills and knowledge of ninja organisations. * Magnetic whip-star: with deployable blades and zip line. * Tonfa sword: hand-forged folded steel defensive sword. * Telescopic headgear: 100X magnification and infrared night vision. * Enviro-hazard mask: oxygen stabiliser and filtration apparatus that allows breathing in hazardous environments. G.I. Joe Sigma 6 is the code name for a new group of covert G.I. Joe operatives with highly specialised capabilities. They use innovative technology and gear designed exclusively for each of their missions. Working against them is the evil Cobra organisation, whose goal is to take control of the world by sabotage, espionage and outright destruction. Sigma 6 fights them at every turn and provides a swift solution to critical situations around the globe. 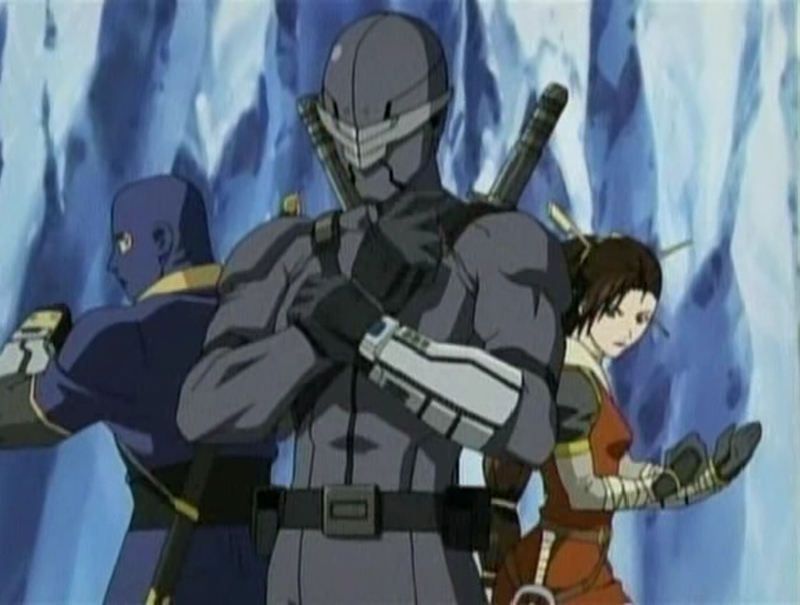 Snake Eyes makes his appearance as part of the G.I. Joe: Sigma 6 toy series. As of September 2006, he has had seven 8" Sigma 6 Commando Scale Figures and been packaged with six different 2.5" Sigma Scale Mission Sets (Most are posed and do not have additional accessories, made at this scale for large vehicles of the Sigma 6 line). Snake-Eyes's custom motorcycle has been sold at the 8" scale, with the ability to transform into a hover cycle and equipped with many hidden weapons, and twice at the 2.5" scale. He has been sold with Timber once, at the 8" scale, and this is the first incarnation of Timber which was fully poseable, rather than being a solid molded piece. The Swords and knife have adaptor on the butts and the can connect together. Funny Story I got some G.I. Joe Sigma 6 figures from a local Comic store Comic Land. The Owner a cool guy always gives me a good deal. I later sold Snake Eyes on Craigslist (Big Regret) as always I needed the money at the moment and I also had Snake Eyes (MIB). Few years later I found a ad on Craigslist selling Snake Eyes complete. It turns out hew was the same guy I sold Snake Eyes to. I also got Snake Eyes for a cheaper price than I sold him for. I'm not big on sigma six but I like this Snake Eyes.Now that I look at these figures more ,they remind me alot of Hasbros Mashers .